Aims and Objectives: The aim of the study is to assess any considerable differences in the incidence and severity of postobturation pain after single- and multiple-visit root canal treatment. Materials and Methods: We carried our study on 400 successive patients who needed root canal treatment. They were randomly categorized into two groups of 200 each. First group underwent single-visit treatment and the other group underwent multiple-visit therapy. 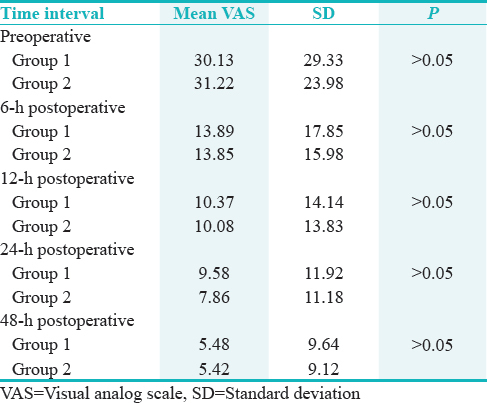 Visual analog scale was employed to evaluate pain preoperatively and postoperatively at 6, 12, 24, and 48 h after obturation. The Statistical Package for the Social Sciences version 20 was employed for analysis. Results: There was a male predominance (235; 60.26%). Of 390 cases, 167 were vital and 223 were nonvital. There was an insignificant difference between the preoperative and postoperative pain levels of vital and nonvital teeth of both the groups at different time intervals. Conclusion: There was a less incidence of pain in multiple visit group than single-visit one, which was statistically significant. We carried out this randomized controlled trial to determine the incidence and/or severity of postoperative pain and the number of visits for endodontic treatment using “Crown-Down” technique with rotary nickel–titanium (NiTi) instruments. This study was conducted on 400 consecutive patients who visited King Fahad Specialist hospital, Al-Qassim, Saudi Arabia, for RCT. The study was carried from July 2017 to May 2018. The study has registered ethical committee approval and consent was attained from all participants (RCT registration number: KFSH/E12A/2017). The sample size was estimated using formula sample size n = (DEFF × Np [1 − p])/([d2/Z21-α/2× (N − 1) + P × (1 − p)]), with 95% confidence level, we obtained 384 as sample size, expecting few dropouts, we rounded it to 400. Patients were randomly grouped into two categories (S and M), 200 each, by computer random draw method. Group S underwent single-visit RCT with zinc-oxide eugenol (ZOE) obturation, whereas Group M underwent conventional multiple-visit RCT, with intracanal calcium hydroxide and obturation with ZOE. 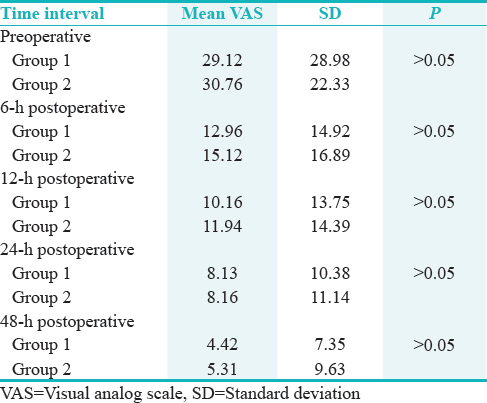 Visual Analog Scale (VAS, modified Heft Parker) was employed to measure preoperative pain and also postobturation pain at 6, 12, 24, and 48 h postobturation. Teeth with completely formed foramina and no calcified canals. Patients below 18 years of age. Pulp vitality was determined by electric pulp tester (Analytic Technology Corp., Redmond, WA, USA). Initially, the endodontist who was performing the procedure was properly trained how to use a VAS. Before the treatment, all the participants were told to put a mark on the horizontal scale to correspond to pain intensity with the help of verbal descriptors as a guide. After treatment, they were requested to fill forms after 6, 12, 24, and 48 h of obturation and return to the department. All the procedures were done by a single operator. 2% lidocaine with 1:80,000 epinephrine local anesthesia (Xicaine®, ICPA Health Products, India) was given followed by rubber dam isolation (Hygienic®, Coltene/Whaledent Inc., USA), pulp extirpation, and access preparation. Canals were prepared by hand files and ProTaper engine-driven rotary NiTi files (Dentsply Maillefer, Ballaigues, Switzerland). About 2.5% hypochlorite was used as irrigant, and all teeth were prepared to working length, and with paper points, canals were dried. Then, Group S canals were filled with ProTaper universal gutta-percha (Dentsply Maillefer) and AH plus sealer (Dentsply DeTrey GmbH, Konstanz, Germany), by lateral compaction method and restored with temporary restorative material (Cavit G). 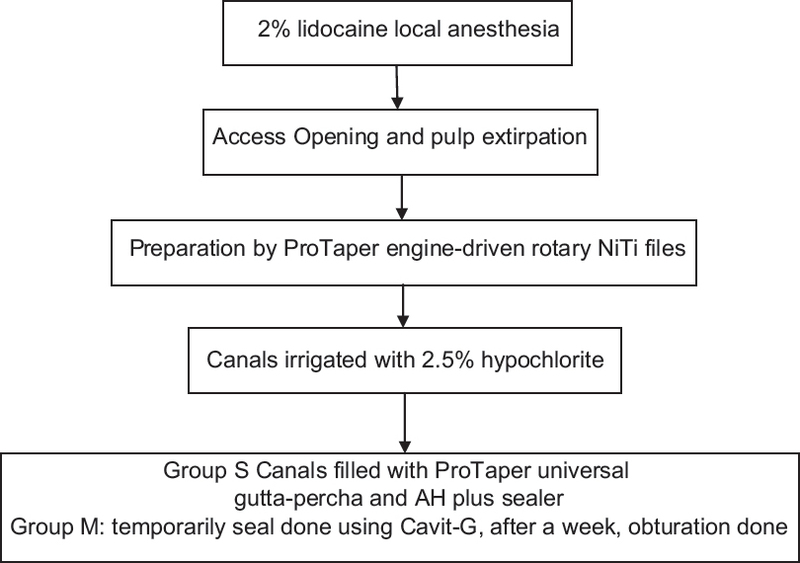 However, in Group M canals, sterile dry cotton pellet was put in the pulp chamber, and temporarily seal of the access was done using Cavit-G. After a week, obturation was done [Figure 1]. The filled VAS forms were collected 48 h postobturation. The obtained data were entered on a Microsoft Excel sheet. The Statistical Package for the Social Sciences (SPSS) version 20 (SPSS Inc., Chicago, IL, USA) was used for analysis. Independent sample t-test was done for analysis. Sample size was determined from a similar studies using the formula: n = ([zα + zβ] σd) 2. With a confidence interval of 95% and power of 95% for the study, a sample size of 300 was obtained. P < 0.05 was considered statistically significant. Ten patients (five each from both the groups) were excluded as they did not report back, making the effective sample size as 390 [Table 1], [Figure 2] and [Figure 3]. Complications or experience of flare-ups were not noticed. 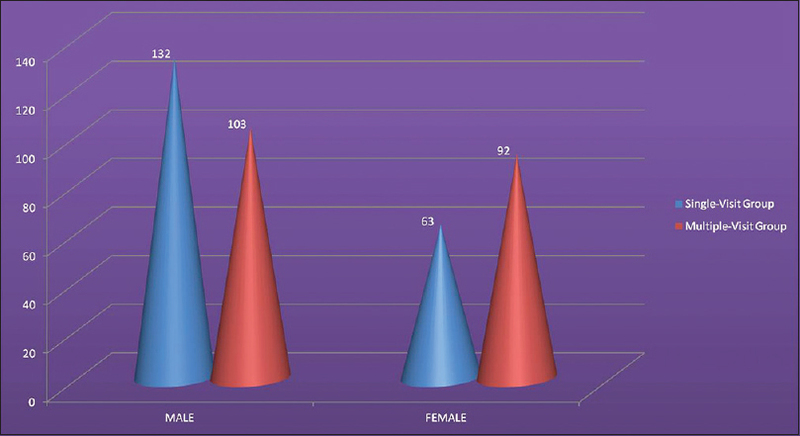 Gender of the data revealed a male predominance (60.26% [Table 2]). Independent sample t-test was done for mean and standard deviation of pain at different time intervals, and it revealed statistically insignificant variation in the pre and postoperative pain levels of both the groups [Table 3]. Of 390 cases, 167 were vital and 223 were nonvital. 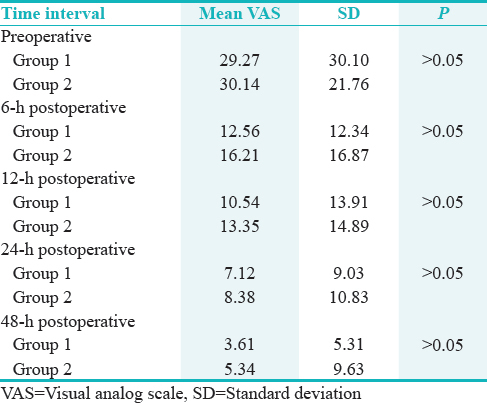 There was an insignificant difference between the preoperative and postoperative pain levels of vital and nonvital teeth of both the groups at different time intervals [Table 4], [Table 5] and [Figure 4]. Our first objective was to find the variation in pain incidence in these two methods. We found less incidence of pain in multi-visit group than single-visit one, which was statistically insignificant. Our findings are in accordance with C. Keskin et al. and Soltanoff and Montclair. Soares and César evaluated the postoperative pain incidence and periapical healing after 12 months of RCT and found single-session therapy to be successful clinically in 100% of the cases, even though radiographic success was lagging far behind. However, Roane et al. reported contrast findings that the incidence of pain was higher at a ratio of 2:1 after multi-visit treatment than single-visit mode. Our second objective was to assess the intensity of pain and the presence of any flare-ups. We observed that the intensity of pain was more in single-visit group, and there were not any flare-ups. Eleazer and Eleazer reported that single-visit RCT is better than multiple-visit treatment regarding flare-ups. Mulhern et al. did not observe any significant variation among the pain levels of teeth treated in both groups. A systematic review revealed that continual irrigation with profuse quantity of antimicrobial agents and mechanical instrumentation significantly reduces intracanal bacterial level. We did not record the potential confounding factors, such as the obturation quality and experience of the endodontist. Because of this limitation, our findings have to be interpreted with care. In the future, studies have to be carried out in endodontic clinical settings with adequately longer follow-up periods since complications are usually expected to arise in the long term. 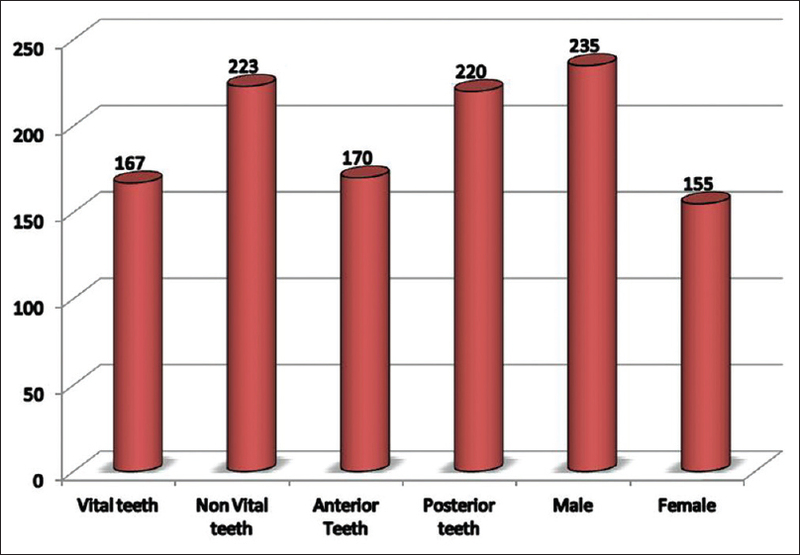 An insignificant variation was observed among the pre and postoperative pain levels of both vital and nonvital teeth. Variations between single- and multiple-rooted teeth should have been carried out. We observed less incidence of pain in two-visit group than single-visit one, which was not statistically insignificant and also found more intense pain in single-visit category and did not notice any flare-ups in multi-visit group. Figini L, Lodi G, Gorni F, Gagliani M. Single versus multiple visits for endodontic treatment of permanent teeth. J Endod 2007;(4):1041-7. Ng YL, Mann V, Rahbaran S, Lewsey J, Gulabivala K. Outcome of primary root canal treatment: Systematic review of the literature – Part 2. Influence of clinical factors. Int Endod J 2008;41:6-31. Singh S, Garg A. Incidence of post-operative pain after single visit and multiple visit root canal treatment: A randomized controlled trial. J Conserv Dent 2012;15:323-7. Patil AA, Joshi SB, Bhagwat SV, Patil SA. Incidence of postoperative pain after single visit and two visit root canal therapy: A randomized controlled trial. J Clin Diagn Res 2016;10:ZC09-12. Bharuka SB, Mandroli PS. Single-versus two-visit pulpectomy treatment in primary teeth with apical periodontitis: A double-blind, parallel group, randomized controlled trial. J Indian Soc Pedod Prev Dent 2016;34:383-90. Matsuzaki E, Anan H, Matsumoto N, Hatakeyama J, Minakami M, Izumi T. Immunopathology of apical periodontitis and refractory cases. J Tissue Sci Eng 2016;7:184. Keskin C, Demiryurek EO, Ozyurek T. Postoperative pain after single-versus-multiple visit root canal treatment in teeth with vital or non-vital pulps in a Turkish population. Asian J Sci Res 2015;8:413-20. Wong AW, Tsang CS, Zhang S, Li KY, Zhang C, Chu CH, et al. Treatment outcomes of single-visit versus multiple-visit non-surgical endodontic therapy: A randomised clinical trial. BMC Oral Health 2015;15:162. Manfredi M, Figini L, Gagliani M, Lodi G. Single versus multiple visits for endodontic treatment of permanent teeth. Cochrane Database Syst Rev 2016;12:CD005296. Wong YJ. Similar treatment outcomes when performing endodontic therapy on permanent teeth in a single visit or multiple visits. J Am Dent Assoc 2017;148:687-9. Moreira MS, Anuar AS, Tedesco TK, Dos Santos M, Morimoto S. Endodontic treatment in single and multiple visits: An overview of systematic reviews. J Endod 2017;43:864-70. Bartols A, Laux G, Walther W. Multiple-file vs. single-file endodontics in dental practice: A study in routine care. PeerJ 2016;4:e2765. Vieyra JP, Acosta FO, Osuna SK. Incidence of flare-Ups and apical healing after single-visit or two visits treatment of teeth with necrotic pulp and apical periodontitis after a two-year control period. A randomized clinical trial. J Dent Oral Health 2018;4:111. Schwendicke F, Göstemeyer G. Single-visit or multiple-visit root canal treatment: Systematic review, meta-analysis and trial sequential analysis. BMJ Open 2017;7:e013115. Sharma S, Mahajan N, Kotwal B, Gupta R, Kharyal S, Tomar D. Incidence of post-operative pain in single versus multiple visit root canal treatment of vital and non-vital single rooted teeth. Int J Sci Stud 2017;5:145-8. Tanalp J, Sunay H, Bayirli G. Cross-sectional evaluation of post-operative pain and flare-ups in endodontic treatments using a type of rotary instruments. Acta Odontol Scand 2013;71:733-9. Almeida DO, Chaves SC, Souza RA, Soares FF. Outcome of single- vs. multiple-visit endodontic therapy of nonvital teeth: A meta-analysis. J Contemp Dent Pract 2017;18:330-6. Sevekar SA, Gowda SH. Postoperative pain and flare-ups: Comparison of incidence between single and multiple visit pulpectomy in primary molars. J Clin Diagn Res 2017;11:ZC09-12. Brignardello-Petersen R. Very similar long-term complication rate and short-term incidence rate when comparing single-visit and multiple-visit endodontic treatments. J Am Dent Assoc 2017;148:e70. Soltanoff W, Montclair NJ. A comparative study of the single visit and the multiple – Visit endodontic procedure. J Endod 1978;4:278-81. Soares JA, César CA. Clinic and radiographic evaluation of one-appointment root canal therapy in teeth with chronic periapical lesions. Pesqui Odontol Bras 2001;15:138-144. Roane JB, Dryden JA, Grimes EW. 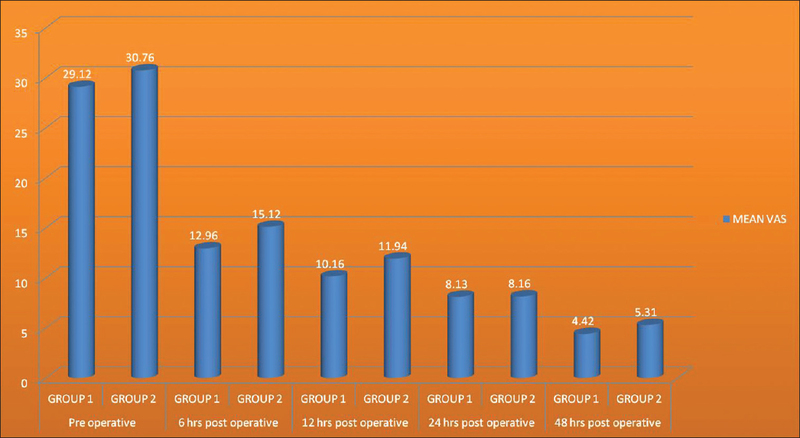 Incidence of postoperative pain after single- and multiple-visit endodontic procedures. Oral Surg Oral Med Oral Pathol 1983;55:68-72. Eleazer PD, Eleazer KR. Flare-up rate in pulpally necrotic molars in one-visit versus two-visit endodontic treatment. J Endod 1998;24:614-6. Mulhern JM, Patterson SS, Newton CW, Ringel AM. Incidence of postoperative pain after one-appointment endodontic treatment of asymptomatic pulpal necross in single-rooted teeth. J Endod 1982;8:370-5. Sathorn C, Parashos P, Messer H. Antibacterial efficacy of calcium hydroxide intracanal dressing: A systematic review and meta-analysis. Int Endod J 2007;40:2-10. Ciftçi A, Vardarli DA, Sönmez IS. Coronal microleakage of four endodontic temporary restorative materials: An in vitro study. Oral Surg Oral Med Oral Pathol Oral Radiol Endod 2009;108:e67-70.